Festival of the Tiny Ornaments — The holidays are upon us! It is time to break out all the merriment and cheer. It also also a time to spread joy and your creativity. Join us for the Festival of the Tiny Ornaments and draw, sketch and create some holiday decorations of your own! Join Chef Miker as he wishes you a Hairy Fish Mess to you and your family! You can draw along with Chef Miker and all of the artists of Camp PencilPoint. Check out CampPencilPoint.com and you can download the custom shape for this year’s ornament. You can use this shape to draw your own festive creature. By popular demand, Chef Miker chose to draw a happy mustached fish. You can choose any creature your heart desires. 1) Print out the custom shape from camppencilpoint.com on a regular sheet of paper (click on the image below). You will use this shape to draw your creature. Challenge yourself and try to fit your creature within the shape. Be creative and have fun. You can simply cut out your ornament and finish it there, but if you want to make it shrink, you may need to do some shopping. 2) The next step is to buy some “shrink plastic” which can be found at many art and hobby stores such as Michaels and Joann. You can even find them in the craft section of Target. However, if you want to find blank sheets of shrink plastic, you may have to order them online. We recommend searching for the terms “shrink art”, “shrink plastic” or “shrinky dinks”. PLEASE NOTE: For safety, please follow all the manufacturer’s directions on the package and use proper supervision when using the oven. 3) Transfer your drawing to the shrink plastic. Make sure you are drawing on the textured side of the plastic. We recommend using markers for this process. However the ink will smudge easily on the pastic, so be very careful where you place your hand as you draw. Markers give you a clean and solid color when the plastic shrinks. You can also use colored pencils, and those will give you a more textured look when your plastic shrinks. Draw slowly and carefully. This is your final art, so take your time and do your best. As Joe Foo mentions in the video, you are not tracing your image rather you are crafting your final artwork. 4) When your drawing is done, use scissors to carefully cut out your ornament. The plastic is fragile and tears easily, so leave a comfortable amount of space around your shape in case you slip. You may also want to leave a shape at the top make a hole to allow you to hang your ornament. You can use a hole punch to make this hole. 5) As mentioned before, follow the manufacturer’s direction before using the oven, and make sure you have proper supervision. Your ornaments will shrink in a preheated oven between 300º-350º depending on what the instructions suggest. Your ornaments will shrink quickly. Don’t panic if they start to curl up, just give them a few more seconds to bake. They should flatted out (if the oven is set to the proper temperature). 6) Use oven mitts when removing anything hot from the oven, and allow your ornament some time to cool off. After it is cool to touch, feel free to hang your ornament with a hook or a ribbon. Give your art as a gift to family and friends and spread the joy of your unique art. 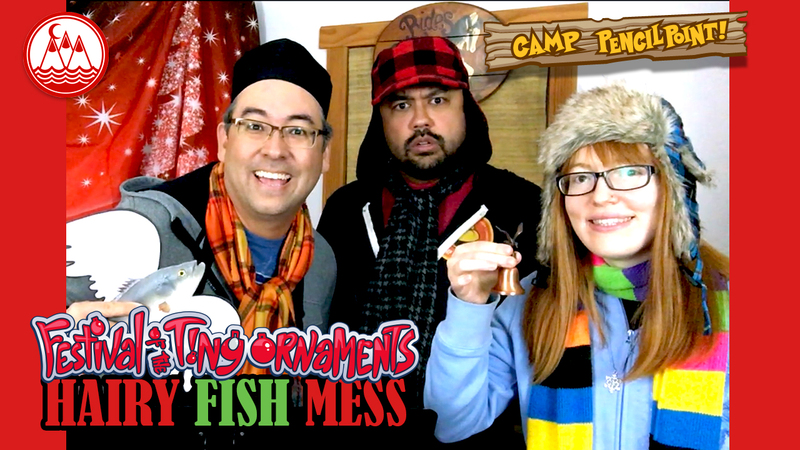 Emily and Joe Foo will create their own ornaments in future videos, so subscribe to this YouTube channel and keep checking out camppencilpoint.com for more fun! 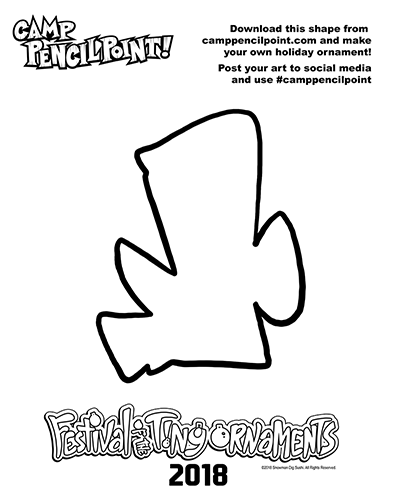 And if you draw your own festive creature, post your art to social media and use the hashtag #CAMPPENCILPOINT. The artists of Camp PencilPoint find it, they will award you the Festival of the Tiny Ornaments badge! Please subscribe to our YouTube channel for all the latest drawing videos! Visit http://camppencilpoint.com for more tutorials, news, appearances and arts and stuff. Check out the all of our videos and enjoy all the of nonsense and tomfoolery! 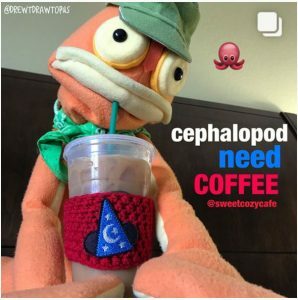 For the latest on everything going on at Camp PencilPoint, follow Drew T Drawtopus on Instagram or on Facebook. Follow Joe Foo on Instagram. Jazzy background music by FoolBoy Media.